Imagine an office where you can access a ‘cottage garden’ on one floor and a ‘meadow’ on another. Most offices don’t even have a single plant in them. But this tiered, verdant vision is at the heart of Marks Barfield Architects’ new Stephenson House scheme in Euston, London. The 23,000 sq m mixed-use development — with 17,000 sq m dedicated to Grade A office space — is an ambitious refurbishment project that will strip an existing Sixties concrete office building down to its frame and almost completely rebuild it, with only minor changes to the current massing. On the corner of major north-south London artery Hampstead Road (part of the A400) and the popular, though smaller, Drummond Street, Stephenson House occupies a site on a strategic east-west route connecting Euston to Regent’s Park as part of the wider area’s regeneration. Wellbeing is a driving force in the design, and one Marks Barfield very much put on the table — though its client, Lazari Investments, happily welcomed it. From a financial standpoint at least, studies have shown that gains in staff wellbeing can reduce sick leave, improve productivity and ultimately reduce overall financial costs. But the benefits are clearly not only financial. ‘We’re keen to make a step change,’ says Marks Barfield managing director Julia Barfield of the leading role of wellbeing in the design, which responds to the WELL Building Institute principles. She says the intention is ‘to create a building that embraces the wellbeing agenda and biophilic design — that puts people first’. Creating a connection to nature and embracing biodiversity has been brought to the fore wherever possible in the building and has been done in collaboration with The Landscape Partnership. The aforementioned stepped garden terraces — of which there are five — have different ‘characters’, where the choice of plants respond to the very specific microclimate and amount of natural light available on each level, while also aiming to represent a wide range of the UK’s landscape. From the lowest to the highest level, the outdoor spaces comprise the ‘cottage garden’, the ‘meadow’, the ‘woodland’, the ‘heathland’ and the ‘highlands’. 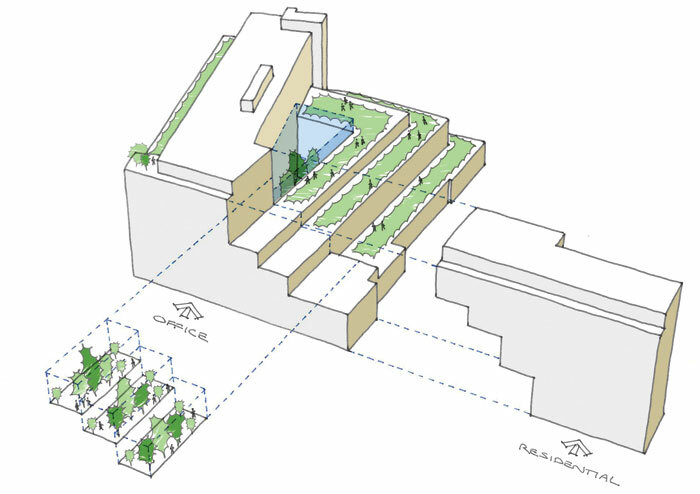 Double-height ‘pocket gardens’, connected to the terraces, create additional green spaces, which also serve to visually and practically separate the office space from the residential units. This is backed by recent research on plants’ air-cleaning abilities by NASA. In fact one of the most striking things about the Stephenson House project is the in-depth engagement with research that Marks Barfield has undertaken. This is no token ‘green-washing’ — it is an exhaustively researched understanding of what, and how, green elements can support health and wellbeing. The central atrium also pulls additional natural light down into the office floors. To enhance the light in this space even further, Marks Barfield is exploring using mirrored strips to create a luminous visual effect. More generally, the practice is keen on embracing circadian design principles with an abundance of glare-controlled natural daylight. The atrium design also encourages a more active lifestyle: a feature staircase aims to make it more natural for people to choose the stairs rather than opt for the lift. Other elements of the design, such as the cycle parking for 240 bikes — and removal of all of the current 76 car-parking spaces apart from disabled bays — support this promotion of a healthy way of living for occupants. Social spaces and breakout spaces on the office floors also encourage mental wellbeing through social interaction. The project’s focus on nature also extends beyond the wellbeing agenda to achieve a high level of environmental sustainability. The garden terraces form a ‘blue roof’, with rainwater attenuation achieving SUDS (sustainable drainage) requirements. Passive solar heating, water-saving features and efficient ventilation, mean overall it is a low-energy building. The residential section of the building — introduced as a response to Camden Council’s requirements — includes 17 flats with balconies, six to be at an affordable London rent. On the semi-public ground floor of Stephenson House there will be retail and a corner cafe. The corner location will be visually marked by a feature called The Lantern — a full-height ‘pleated’ glazed facade, which will add a faceted geometry to the visual composition of the otherwise brick-and-stone exterior. Having successfully won planning consent, the scheme will begin construction in November, and completion is due for late 2020.